Shaving soap in a cup is just so charming. If you are wondering about the cup, yes it is soap too. 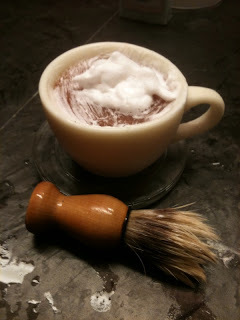 To use wet the shaving brush and move around the shaving soap in circular motion and you'll have a lovely thick foam. This set is $25, cup weighing over 200gms with a clear glass soap dish and of course the brush. It's a fun way to shave. For ladies who may want shave their legs, this works perfectly as well. It comes in Sensual Sandalwood, Citrus, Minty Melon and Love spell. Skin products for specific skin types have been available for a number of years now, and products like shaving soaps, shaving creams, and facial skin care which are formulated for men are slowly gaining popularity. However, before choosing what products to use on their faces, men should start with the basic issue, and that is to know specific skin type first.